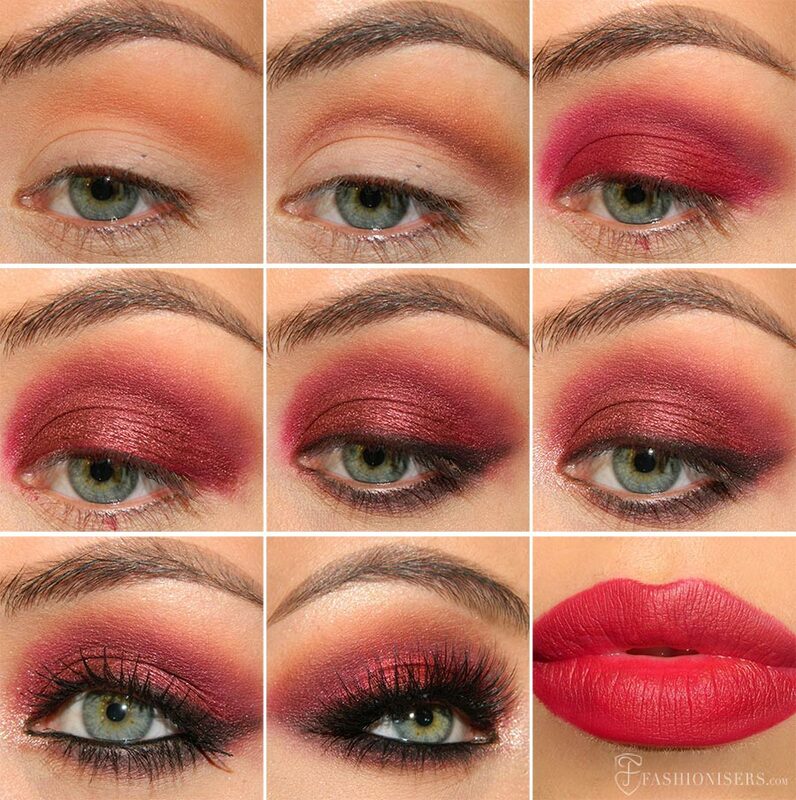 Beautiful, bold and bright Marsala is the color of 2015, therefore this lovely Marsala makeup tutorial may come in handy for embracing the biggest trend of the year beauty wise. Marsala is a strong and sweet wine color with a brownish tint, named after the famous Sicilian town of Marsala. It’s a chic burgundy color with a brown midtone, which is quite reminiscent of the ’90s fashion. Wear Marsala on your peepers, lips, nails and even cheeks and you are sure to look drop-dead gorgeous and memorable especially when clubbing or getting ready for a Valentine’s Day date or any other special occasion. We can rightly say that Marsala is far the most practical, wearable and elegant color announced by Pantone recently, so you have no excuse for not trying to wear it at least once. Unless you are a professional makeup artist, it may be quite difficult to wear bold and rich colors in your makeup without making a mistake. 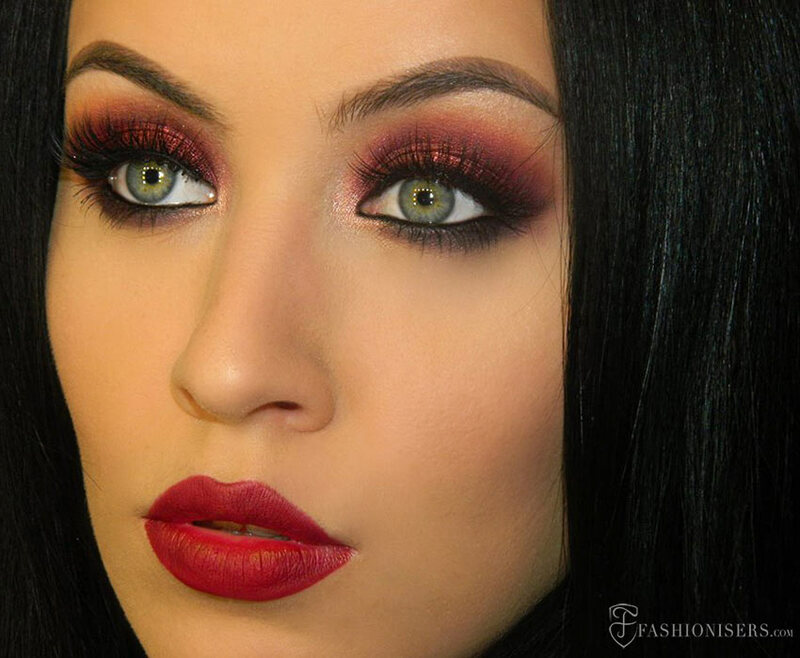 While the no makeup makeup look is the go-to option for everyday wear and for all those beginner makeup artists, no one can deny that it’s the opulent and juicy colors that make a big statement in the fashion world. In case you are into a simplistic makeup style yet want to look on-trend embracing the dramatic effect of Marsala makeup, add a tint of burgundy wine either on your lips or on your eyes, keeping the rest of the face in neutral shades. Otherwise, when trying to land in the spotlight at important parties, channel your inner goddess and pair a bold Marsala eye makeup with the same color used on the lips. Either way, you are sure to be the bombshell of the party being in the center of everyone’s attention and admiration. Step 1: Since the Marsala color is already bold and should be the focus of your makeup look, you’ll want to keep the entire face as soft and neutral as possible. For this, go for the most natural foundation color according to your skin tone, applying it over a makeup base for a more flawless result. Use concealer to hide skin imperfections and set your makeup applying a loose translucent powder at the end. A delicate pink or peach blush tone is the ideal color you need for sculpting your face, since deeper colors might contradict with the boldness of Marsala. Step 2: You still want to have perfectly contoured eyebrows, therefore using your favorite eyebrow kit for filling them in is the next step. Step 3: Prep your lids for the Marsala eye makeup by priming them in order to enjoy the long-lasting and fresh look and prevent the eyeshadows from creasing (Too Faced Shadow Insurance). Now, apply a light neutral peach eyeshadow to the high crease of your eyes (Anastasia Beverly Hills Orange Soda) and blend it with an orange-brown color (ABH Sienna). 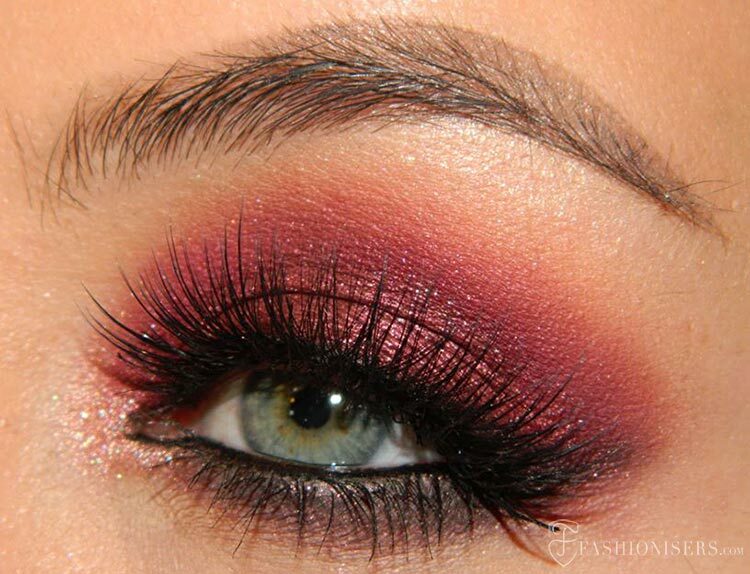 To define the crease even better, apply a dark burgundy eyeshadow (Cherry Cordial from Too Faced Chocolate Bar Palette). Step 4: Apply a Marsala watercolor eyeshadow all over your lid and blend it smoothly to the colors you have used earlier (Make-up Atelier Paris F10 Watercolor). Apply a Marsala pigment over the watercolor eyeshadow for an even more dramatic look (MAC Heritage Rouge pigment from the Objects of Affection collection). Step 5: Apply a black eyeshadow close to the root of your upper eyelashes (ABH Noir) and then highlight the inner corner of the eyes with a tan/rose pigment (MAC Tan Pigment). Step 6: Apply black gel eyeliner to your waterline (Inglot AMC Gel Eyeliner #77) and blend a black eyshadow with the Marsala pigment on your lower lid. Step 7: Apply black mascara and use falsies when getting ready for special occasions. Step 8: Coming down to the lips and sticking to the common makeup rule of balancing the eye makeup with lip colors, you can apply a clear lip-gloss for a more delicate look. Otherwise, you can bring out your wild side and match your eye makeup with a Marsala lipstick, looking really bold and party-ready! Warning! 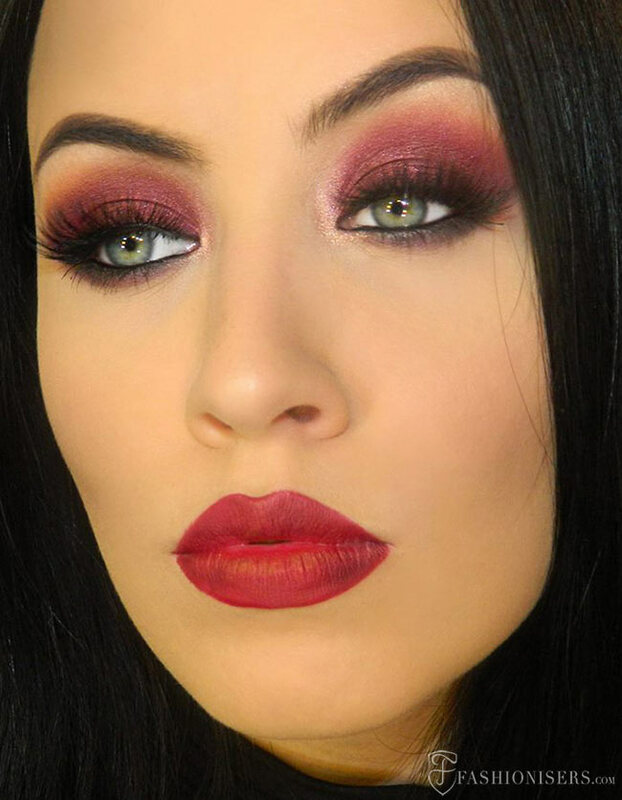 Wearing this Marsala makeup look once, you are sure to become obsessed with this rich color and make it your favorite makeup option to sport for attending various events!